Limestone relief. In sunk relief, at left Nefertiti, preserved head and neck, kissing a princess whose arm is extended around her mother. 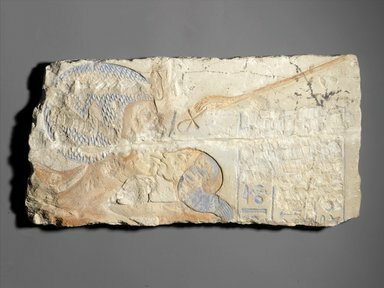 At right, three mutilated columns of text and above, one ray of the Aten holding an ankh. Flesh folds indicated on necks of both figures. Queen wears braided wig with diadem. The princess wears long side-lock and earrings. “The princess, of his body, his beloved Merit-Aton”. Condition: Broken lengthwise into two pieces. Ancient pigment: all blue in inscription at right, on the queen's wig and on hair lock of princess. Ancient red pigment on ribbon of queen's wig, on area around earring, on center of neck, between lips, and chin of the two faces, on forehead of princess, on hand of Aten and the ankh.